At roughly 9:00 PM in the evening on Sunday, October 8, 1871, a quick-burning inferno engulfed the O'Leary family barn on DeKoven Street in Chicago. The fire was so hot and moved so quickly that the city's 185 firefighters were helpless to stop the spread. Fully 3.3 square miles of the city—2,112 acres—went up in flames. 300 people were killed and 17,500 buildings were destroyed. The fire raged for two whole days, finally ending on October 10th. 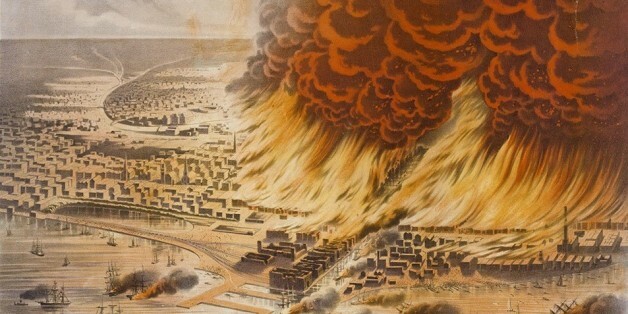 It remains perhaps the most famous fire in American history, known to this day as the "Great Chicago Fire." Chicago Tribune reporter Michael Ahern quickly published an article suggesting that Mrs. O'Leary's cow was the culprit, having kicked over a lantern during milking. The rumor persists to this day, but Ahern himself admitted in 1893 that he made the whole story up, and researchers agree that no one knows what really started the fire. Its origin remains a mystery. The Great Chicago Fire is regularly taught in American history classes and certainly steals all the fame, but a much larger and deadlier fire began that same day, 200 miles north in Peshtigo, Wisconsin. The Peshtigo Fire was one of the fastest-spreading wildfires the country had ever witnessed. Within hours 1.2 million acres were incinerated, which is an area 50% larger than the state of Rhode Island. A dozen towns were completely destroyed. Somewhere between 1,500 and 2,500 people were burned alive. And like the more famous fire south, the Peshtigo Fire's exact origin remains a mystery. The Great Michigan Fire, which burned twice as much land as the simultaneous fire in Wisconsin. It destroyed dozens of communities and the loss of life is still unknown. The Port Huron Fire killed 50 people. The Miramichi Fire on October 7, 1825. It was the third largest single fire ever recorded in North America. Three million acres were scorched and up to 300 people were killed. Four different wildfires broke out in Northern California. Then the very next day, on October 9th, seven more fires were kindled in the region. One of the four October 8th fires grew to become the single most destructive wildfire in California state history. Over 5,000 buildings were destroyed and 22 people were killed. Collectively, the fires killed 44 people, making them the deadliest the state had ever seen. An investigation as to the origin of these fires was inconclusive, but some suggested they were caused by strong winds and downed power lines. But 11 distinct fires in the same two-day period all caused by power lines? That sounds like a woefully inadequate explanation. What is it with these dates? 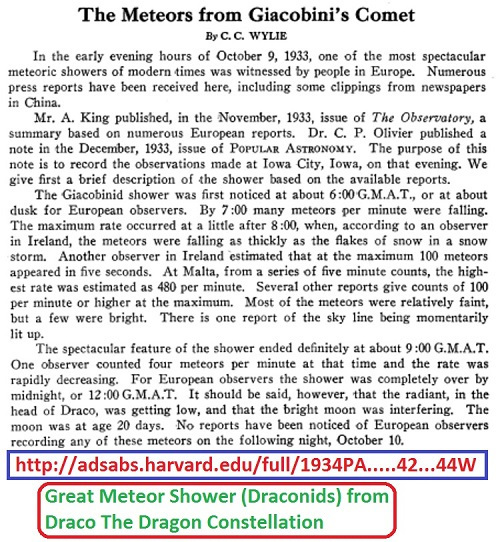 I think we just might have a reasonable answer in the form of the Draconids meteor shower, which occurs every year without fail from October 6–10, and appears to emanate from Draco the Dragon. 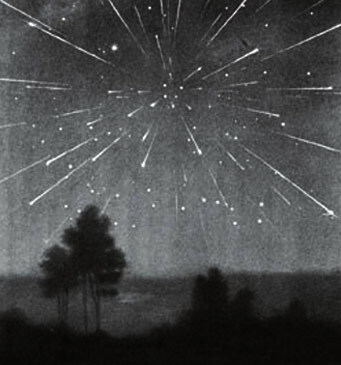 The Draconids are highly unpredictable, most years seeing only a few scattered shooting stars per hour, but other years witnessing thousands upon thousands per hour. 1933 and 1946 were just such years. In the early morning hours of October 9, 1933 millions witnessed "one of the most spectacular meteoric showers of modern times." Draco the Dragon spewed his usual rocks towards the earth, but this time the number of shooting stars was simply immeasurable. No one living could count the number. There were reportedly thousands—possibly even tens of thousands—of meteors burning up in earth's atmosphere. It was the very year that one Adolf Hitler rose to power in Germany, gaining control of the Reichstag and becoming Chancellor and absolute dictator. Then in 1946, the Draconids made another astonishing appearance. Again with thousands of shooting stars per hour. It was the very year that President Donald Trump was born. It was also the year immediately after the birth of the proto-global government in the form of the United Nations (1945), and the year immediately before the mandate to establish the nation of Israel (1947). According to eyewitnesses, these showers were simply incomprehensible. Many thought it was legitimately the end of the world. Can you imagine what seeing thousands of "stars" falling to earth would look like? In retrospect, astronomers have learned that part of what makes a particular year's Draconids so spectacular is the earth's proximity to the tail of Comet 21P when the earth crosses through the comet's orbital path. This comet is the source of the Draconids and orbits the Sun every 6.6 years. The earth passes through the comet's orbit every year (from October 6–10), but it often happens many months or even years after the comet has passed by. 1933 and 1946 were different. In one instance Comet 21P had passed through only 25 days before the earth crossed its path, so there was an immense amount of debris entering the earth's atmosphere. This brings us to 2018 and what in a few days could possibly be a major and unexpected meteor storm. This year we are closer to the comet when we enter its orbit than we've ever been in modern times—just 22.7 days. That's closer than even 1933 or 1946. You can find the journal on the Harvard University website. Hats off to Brad at Revelation 12 Daily for spotting this! And notice the last sentence above: In February 2029 the comet will have a close approach to Jupiter, which will throw off the comet's orbit, making 2018 and 2031 perhaps the last two years in human history for the Draconids to make a large appearance. And this year is particularly ideal because of the phase of the moon. The primary determinants for good meteor shower visibility are 1. the phase of the moon, and 2. cloud cover. 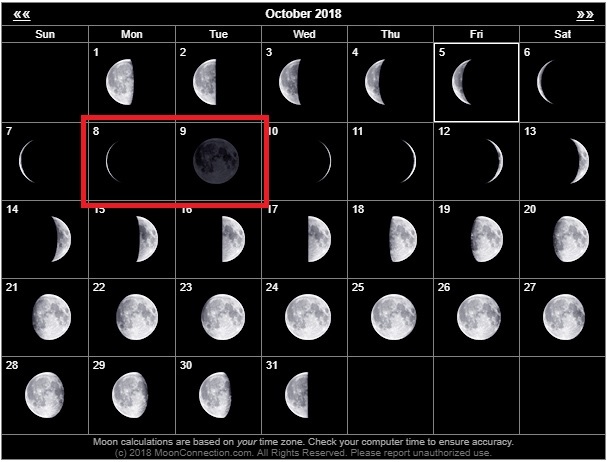 The phase of the moon affects visibility for the whole planet and it just so happens that on the evening of October 8, 2018, right as the Draconids are peaking, the moon will be almost completely dark. And the next evening, on the 9th, the moon will be totally dark. In other words, visibility will be theoretically perfect because the light of the moon won't cause any interference. Based on a likely underpinning for the Sign of the Dragon referenced in Revelation 12:3–4, this might mean we could witness the astronomical aspect of this sign in just a few days. This doesn't tell us when the rapture of the Church will occur or when the sign's inherent meaning (Rev. 12:7–9) will be fulfilled, but it could tell us we are getting much closer. Verses 1–2: An astronomical sign of a woman in labor with a male child. She is clothed with the Sun, has a crown of twelve stars, and has the moon under her feet. This occurred on September 23–24, 2017. Verses 3–4: An astronomical sign of a seven-headed dragon with seven crowns on its heads. Its tail appears to fling one-third of the stars in heaven to the earth. We think we have a good understanding of what this dragon is and where its heads and crowns are, but one-third of the stars of heaven falling to the earth? I think only a meteor shower could give that appearance. This year is a likely candidate. Verse 5: The actual rapture of the Church into Heaven to appear before God's Throne. We can't know for sure when this will actually occur, but judging by the confluence of once-in-history signs (the rebirth of Israel, Fig Tree Generation, conquest of Jerusalem, Revelation 12 Sign, etc) this is absolutely imminent. The Revelation 12 Sign changes that previous "." into several exclamation marks. Verse 6: Israel flees from the dragon, which is satan. Verses 7–9: The actual meaning behind the astronomical aspect of the Sign of the Dragon is fulfilled when satan and his minions are cast out of Heaven to earth once and for all, never to return. As I've said before, it's a post-Revelation 12 Sign world, which means we're now living at the crossing of the dispensations. If Christ's appearing was once imminent! it's now IMMINENT!! Behold, He is coming soon and He keeps His promises. Perfectly. Don't listen to the faithless rabble-rousers and those who want to steal your blessed hope and kill your joy. They are looking for something other than Christ, whether it be spiritual self-aggrandizement or material preparation. I'm looking for Heaven and my LORD Jesus Christ and to see a few more stragglers get aboard the ark before the floods come. Yes... Excellent work my friend. For anyone wishing to track the Meteor Shower over the next several days, here is a link listing groups and organizations that track these types of things...along with a series of live cameras from the UK. Brad, do we know the timing and will it be visible in the U.S.? "We know when the conditions are right for rain, we the know the general timeframe when it should rain, but it is almost impossible to predict in advance when and where the heaviest rain will actually fall. It is the same with meteor showers." Full post is here if you haven't seen it. Hehehe... I know have a twisted mental image of a cow getting vaporized by a big meteor. Yum yum... extra crispy! Lol, thanks for the article. A VERY interesting connection and theory! I had no idea on the timing of these events. Notable are the tens and ones digits in the years being, "71" and "17". Numerically inverted. On the morning of Monday, November 26, 2018 the sun will rise over Jerusalem. It will be preceded by the Constellation Leo, Virgo and Venus. Venus, the bright morning star will emerge over the horizon in conjunction with Spica, who's name α Virginis means "the virgin's ear of [wheat] grain". With little digging one may find an association to astrology that involves Venus, Spica and what is called the 3rd Tarot (Trump III) "The Empress" card for which I will neither discuss further or provide a link. [Suffice it to say that this information is best dug individually by those mature in their faith. I do not wish to discuss such content that is satanic at its core nor provide links to it in this space]. ...but that pin-point is NOT the purpose of this post. On the heels of the virgin will rise Libra (the Altar) and with it the Sun. But hidden in the sun is the planet we have been following these many months. The king planet, fifth from the Sun, will appear to be, *caught up* by the Sun, the centre of our solar system and perhaps symbolic of the *throne* in the throne room of G-d. This first screen shot is an overall view using a darkened sky to aid in our daytime observation. Note that Venus has *returned* to Virgo having met Jupiter on or about Thursday, October 11, 2018 at Libra through retrograde motion. The following close-up screen shot is shocking to me as the LORD Himself ordered that the file name was "IMG_6923.jpg". If you're new to this space then I will give you a hint. Think the number of man and a date. Note the time of the screen shot. It is how the conjunction will *appear* at 07:26:00 AM local Jerusalem time from beside the Temple Mount. So in a sense, you may say that at 0726 local time in Jerusalem that Jupiter will be caught up harpazó (ἁρπάζω) by the Sun in a symbolic replay of (Revelation 12:5 ESV). And as I sit here typing this I am amazed that the file name my iPhone attached to this screen shot provides a direct reference to *man* via the number six and the day of the Great Sign of Revelation 12 (9/23) being "IMG_6923.jpg". I did NOT manipulate this. It's just how it came out! If the LORD is Sovereign over all things, then He is over all things Sovereign, including the iPhone of an obscure pastor in North America. AND WHO IS IT THAT "WAS CAUGHT UP TO GOD AND TO HIS THRONE"? There's a connection to the number 430 here too. The day count from 9/23/17 to 11/26/18 is 430 days inclusive. The Sabbath count from 9/23/17 to Hanukkah I, 2025 is 430 Sabbaths. How many days total did G-d command that Ezekiel would witness against Israel and Judah laying on his sides? How many years were the Hebrews oppressed by Egypt? If your answer includes the number 430 then you're seeing the same thing that I am! So what's the BIG deal about the number 430? Happy hunting and study well! The tight screen shot above includes the star Acrab in conjunction with Jupiter and the Sun. "Beta Scorpii (β Scorpii, abbreviated Beta Sco, β Sco) is a multiple star system in the southern zodiac constellation of Scorpius. It bore the traditional proper name of Acrab, though the International Astronomical Union now regards that name as applying only to the β Scorpii Aa component." This bears more study but I believe this is a complex of stars, a cluster and a distinct feature in the head of Scorpius. More symbolism drawn in the heavens? Simply amazing, I'm in AWE! I'm very excited and blessed to be one of the sheep of our God and His Son Jesus the Christ! I can't wait to leave this wicked world. Maranatha and thanks for your research brother in Jesus. Pretty cool Pastor Rich! November, I'll take it! The next *part* of the sign I have to offer is that of the woman in the wilderness. What does this mean? 2048 érēmos – properly, an uncultivated, unpopulated place; a desolate (deserted) area; (figuratively) a barren, solitary place that also provides needed quiet (freedom from disturbance)." Get out your astronomy software and wind the clock forward while watching Virgo...you will see her alone with no wandering stars (planets) around her. She is alone and in a "wilderness". Venus, the bright morning star, will conjunct with Spica on or about 11/12/18, (that's a month after Venus visits Jupiter as the king planet leaves Libra *the altar* on, or about, October 11th at the time of the Draconids) turns and begins its retreat from Virgo. This is part of its retrograde motion. This conjunction will be a close one and visible to the naked eye on the morning of 11/13 for North America just before sunrise. By mid-December Venus is leaving Virgo...just in time for HANUKKAH. Hmmm, it's a sign bookending the ἁρπάζω "harpazó" again! It's also "IMG_6924.jpg" on my phone! Get it? Number of *man* and reference to the SECOND DAY of the R12 Sign? (I'm not making this stuff up folks! This is how my report is happening!) Like I said, if G-d is Sovereign, He is Sovereign over all things...and that includes the iPhone of an obscure pastor in North America. Just as our Sun ducks under the horizon Mercury, New Moon and Venus will conjunct with Spica in Virgo. She will no longer be in the wilderness. NOTE: The yellow dotted line represents the imaginary plane that our Sun travels across the sky -- this is the plane of the ecliptic. The planets orbit the Sun and appear to come and go from the constellations. That is NOTHING NEW! It is an annual event. What is NEW is that this happens in conjunction with an order of timed signs and events relative to the beginning of the Great Sign of Revelation 12 on 9/23/17. Does this mean that we should look to THEN for the Rapture? I don't think that would be a good interpretation of this picture. It is an interesting scene that *messenger* Mercury and the *bright morning star* return to Virgo the *virgin* and symbolic of *Israel* meet again with the New Moon of Rosh Chodesh (head of the month) in conjunction with Spica (a binary star system) that literally means *seed* in Hebrew, 736 days after the Great Sign of Revelation 12 began on 9/23/17. This sign may suggest the completion of the Rapture and bookends the event. Possibly even the ACTUAL event itself. Are we looking at another piece of the puzzle? Yes, I think it might be. There is a lot more to explore in this aspect of the sign. Shared for your prayerful examination and exploration. What's this Richard, you trying to make a name for yourself with your own space theory of planets and stars? You people are ridiculous. And it is unbecoming of the people of God to use the Bible and the name of Christ to further your agenda and your own name. You all should be ashamed of yourselves. Shane on you for saying those things! You are supposed to be a Christian..ACT LIKE IT! Its replies like that that makes people turn away from Christians.Love and embrace each other Pete. God is LOVE! I'm glad you posted what you did as there are a couple of things I can share about myself and why I post in this space. Before my days of working in the church and being a computer guy; G-d created me an artist. I spent many years doing artwork for a major national retail chain (household name) that landed in virtually every mailbox in the United States and Canada, on a weekly basis, for the better part of a decade. My wife and I share many talents with her focused in the media. Today I spend my days split between pastoring, producing and supporting a nationally syndicated (daily) Christian program (airing from Hawaii to the eastern US), home schooling our kids, trying to be a better husband and participating with a great team of leaders replanting a local church. The broadcast ministry that I serve reaches over 1M people or more daily. And for all of that, guess what? For the last four years I have worked unpaid. Don't get me wrong, I would prefer to be paid directly for the work of my hands, but the Lord cares for us as we walk through the season we are living in. Do I seek to make a name for myself? Actually, my dream is to plant churches and impact lives for Christ such that nobody would know my name. Who I am is not important as what I have done. On the small scale I enjoy discipling and mentoring; but on the large scale I would rather leave a legacy - not my name. So why do I use my birth name in my posts? Simple. I shun social media (aside from this space) and have no FB or other such page(s). I have no YT channel that pushes *my* agenda, nor do I want one. Yes, I do have a Google+ page but do nothing with it. That is a product of using Google these days. UNSEALED.ORG is the space where I share as this is where I feel called to share, encourage and be a catalyst for Christ. I do see myself as a shepherd of this space and hope to be an encouragement to those who come looking for answers and seek comfort. I have no appetite to see my name in lights. My hope is that the name of Pastor Rich is written in a far better place and engraved on the hands that delivered us from sin and death. The hands of my Lord and G-d, Jesus of Nazareth. The Son of G-d. Our risen Saviour. If proclaiming His Name is an offence, then I am guilty as charged. But I am convinced that by sharing my name while proclaiming His is a call and a charge that I am given. I take that on gladly and hope you do too. Pastor Rich, are you suggesting that we should probably not anticipate the rapture until the end of November? Thanks! Mike, that is a possibility. We have seen many impressive conjunctions, dates and numeric connections. All of them keep pointing to the same thing. With that said...the signs we are given must play out in order that scripture be fulfilled. But if we are looking for fulfilment of the heavenly signs? This one really jumped out at me -- thus sharing here for your consideration and prayerful study. Yes, I am suggesting that we *may* not see the Rapture until the end of November and give this as a potential reason why. No, I am not saying the Rapture will be in November; only that there appears to be a sign that indicates it in the heavens. I still have more data to share on the Great Sign not previously shared. I do believe we are in a temporal season what matches what G-d illustrates through scripture. I am also convicted that the Rapture itself will be a sign to Israel. We, the Church are a sign and will be a sign to the world. The coming Draconids may be the key. I'm waiting to see if they *show-up* or not too! Thanks so much for that explanation! I'll be looking forward to your additional data! For your personal exploration, one date that I had looked at for the Rapture was the anniversary of the River Jordan crossing. That occurs month one, day ten of the spiritual (Torah) calendar. Not that I am trying to set dates, but that I use this as an engine to drive learning and to dig deeper into the Word. It's all about spending time with the LORD and realising just how precious and short our time is! Wow guys wow! I have thought for a while now, and Paster Rich we have briefly on here touched based on it, that we may see the scriptures played out in the heavens as signs completely prior to the actual fulfillment of the scriptures. Additionally, I wondered if we may see all these things played out in the heavens in a 7 year time frame starting with the blood moons. Hmmm. If this were to he the case in my opinion I believe we most likely will see the rapture physically fulfilled on the Feast of Trumpets as expected. I have not done an enough in dept study to confirm my theories, so just food for thought. One thing I know for certain is the time is very short and we will all have the great privilege of going home very very soon. Awesome thought! rather original*,...watching n waiting joyfully! Shalom ! Check out http://www.spaceweather.com/ A coronal canyon is facing the earth set to hit the earth on 7th or 8th. I am NOT an astronomer by trade, but having lived over a half-century with a keen interest in the science, I have never seen anything like this before! I've viewed sunspots before. Never have I even heard of the sun being nearly DIVIDED IN HALF by a sunspot. NOTE: THE ARRIVAL TIME OF THE SOLAR WINDS FROM THIS FEATURE AS IT FACES EARTH? THE DRACONIDS. Fire symbolized in the stars via Earth crossing the debris field of Comet 21P, the great dragon Draco's potential for a major show this year and charged solar plasma *fire* from the Sun impacting in this same time frame? "This is a coronal hole--a place in the sun's atmosphere where magnetic fields open up and allow solar wind to escape. Coronal holes are common, but this one is unusually large. It stretches more than 900,000 km from the sun's north polar crown across the equator into the sun's southern hemisphere. Now that's a grand canyon. The emerging stream of solar wind will reach Earth on Oct. 7th or 8th bringing a 65% chance of minor G1-class geomagnetic storms, according to NOAA. Such storms can affect migratory animals that use magnetic cues for navigation and spark auroras visible in the USA as far south as a line from Maine to Washington." Here is a screen shot taken via Sky Guide of Draco on the evening of 10/11/18 in visible light and in x-rays. (NOTE: X-rays are the next highest wavelength of light next to gamma rays. Gamma rays being the *brightest* and *highest* wavelength in the electromagnetic spectrum we call light). Draco as it will appear in visible *white* light in the northern sky of North America on the night of Thursday, October 11, 2018. Note the curves and shape of the constellation and how they are mirrored to what we are seeing in the sun? This is how Sky Guide renders Draco when viewed in x-rays at the same time as the screen shot above. This region of space appears to be rich in x-rays. Symbolic, or am I seeing things? If it was just this alone, I would say I am making this up out of my own fertile imagination. But in light of the shear weight of everything else we see in signs, events and wonders? Hi Annabel, You're right that I'm not really on-board with Dr Albers. Part of my last job was providing technology and testing support to space-based computing systems for the International Space Station. My job previous to that was in satellite communications and we dealt with space weather everyday. With that said, and acknowledging that I am not a PhD, Dipl Ing or even an ASAP, I do consider it HIGHLY likely that an Unidentified Celestial Object (UCO) *may* have been behind events such as Joshua's long day and the three-hours darkness of Calvary. The three hours of darkness at Calvary could not have been a natural eclipse. It would then fall to either of the DIRECT hand of G-D or His placing a massive space body between Earth and the Sun. Such an object, or dense cloud of objects, would be in orbit around the Sun in the plane of the ecliptic. Perhaps even in an extremely eccentric elliptical orbit. But with all the eyes that are on space these days, ametuer and otherwise, I would think that such objects would have been found by now and published in the mainstream. According to you and Claudia Albers they have. I'm still looking. Thus the reason why I put as much direct information on these posts as I can. Something that anyone with the same tools can find for themselves. This week saw the announcement of finding a candidate "Planet X" by astronomers. It's not hard to find the stories in the mainstream, but it has nothing to do with inner solar system objects. Do we have a rouge brown dwarf roaming the inner planets? We may find out very soon. Blessings to you too my sister! a primitive root; to project (one self), i.e. precede; hence, to anticipate, hasten, meet (usually for help):--come (go, (flee)) before, + disappoint, meet, prevent. One absolutely cannot help but think that the rapture is absolutely and extremely imminent. In conjunction with these heavenly signs, we have some signs "on the ground" so to speak that are linking up prophetically with what the signs in the heavens are telling us. First, has anyone noticed that the we have the "Arch of Baal" that just went up on the Washington National Mall right before the Kavanaugh spectacle started? Here's the kicker, did you know where it went after that? It is very interesting, to say the least, that none other than former American President Barack Obama is in the Netherlands at the Hague speaking about "world rulership" as the "Arch of Baal" just "happens" to arrive and is reconstructed. That's right. The future home of the " Roman Arch of Triumph." As we all may be aware, there will be a supernatural element of demonic possession that will characterize the Antichrist, likely brought about through Satanic ritualism by the global elite working behind the scenes, much like what we are seeing with the Arch of Baal. Not being dogmatic about ... ehem ehem 'anything,' but "just sayin'. When "Trump" was elected in 2016, guess who was murdered for his work exposing more of the Clintons corruption in the very same year. Well, this one is best read when reading the article because of the detail involved for a comment section. I have updated my "BLOODLINE OF THE ANTICHRIST article to include this (what I consider to be) prophetic bombshell. All of these heavenly signs seem to be linking up with the signs and developments on the ground to form a panorama or big picture. Time is indeed short I would say. 444 Triumphal Arch. Spiritual War! Kavanaugh Trump Jesuits.The Ends Justify the Means! Very intriguing! What's this speech of Obama you reference? Hi Gary. Here it is. It looks like the Arch of Baal will be there later this month after Obama has just spoken there. May be coincidence, but I don't know. Initially, from what I had read somewhere else, I got the impression that it was going to be there at the same time that Obama was going to be there. But knowing that these elite occultists tie everything to certain times and time spans in their ritualistic occult practices, perhaps there is a reason why they have waited until a couple weeks after Obama spoke. I dunno. He was speaking in the Netherlands on the 28th, the second day that the Arch was across from the Capitol on the mall. The Arch shows up there in one more week. Hmmmmm. I can't help but think of those evil "BAMAH" high places of Ezekiel 20:29 that God judged Israel for. Something stinks in Washington and the Netherlands, and it smells like Baal. Signs in the sun, moon and stars. Signs in the heavens? That's what comes to mind when I see that sunspot on the sun. Also that situation with the sunspot observatory being closed down. Now we have a very peculiar sunspot on the sun. I don't believe in coincidences. It should be at least noted that with the importance of the Hale-Bopp comet as a glaring prophetic sign and it's seeming connection that it has with Comet 21P in that there were a total of 21 years that elapsed between the two comets, we have the debut of the all new presidential motorcade consisting of "two beasts" (Revelation 13) carrying "Trump" to the "United Nations General Assembly," a platform in which global government will likely emerge from. For those who come here who haven't read this yet can do so below. For those who have, you can skip on down to "PROPHECY UPDATE NUMBER 1" and see the latest. Considering all of these signs in the heavens combined with the developments on the ground, what a grand panaorama of a prophetic picture is forming for us here. It really is a spectacle to behold prophetically speaking for those with the eyes to see. Yes, Hale-Bopp was a very big deal. An interesting note: I came to faith on the weekend of the Hale-Bopp comet in 1997. Gary ... Yes, that is very interesting that you did because I too came to faith about a month or so after it went out of site. I remember looking at it in the night sky night after night and having a sense of awe and wonderment about it. I was intensely interested in what it might mean prophetically before I ever knew to look into biblical matters. There was just something so every and fascinating at the sight of this thing ... like it meant something. Little did I know then that it actually did. Stupid spell correct function on these phones... something so eery, not every. Sherry Griffin ... Hi, I've not ever looked at that site before with the exception of a few moments ago with the link I just left Gary. It just so happened that you asked me about it after I had looked at it for the first time in response to him. I'll take a look around that site and get back to ya. I think we'll be gone before they're cast down, but can you imagine how much the evil will increase when they are? I remember Patrick Heron saying he believed they will be openly manifesting themselves to people. That would certainly cause "men's heart to fail with fear" like in Luke 21. 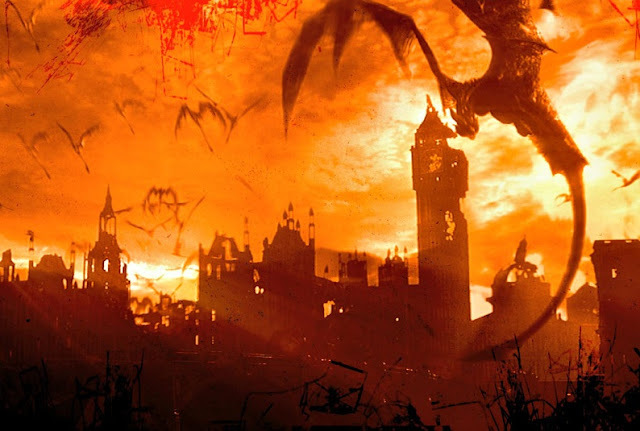 Yes, the Tribulation will essentially be a horror movie. A really, really bad one... that lasts for 7 years. My personal recommendation to all reading: TRUST IN THE LORD JESUS CHRIST RIGHT NOW. God gave me a dream on September 29,2018 of meteors hitting Earth and demons that looked like gargoyles coming out of the impact and taking away specific people. It was somehow known that Jesus was coming this same day as the metors falling to take away the church. Unknown, your dream makes very much sense to me in relation to the attempt to "devour" the man child (the church) directly at / after the rapture i.e. on their way through the air which is Satans territory, space included (Ephesians 2:2) and secondly people left behind could be deceived by some "alien/demon kidnapping" narrative about the vanishing of the church. Thank you for sharing! Blessings to you! Another prophecy being fulfilled right now. Very interesting... not the final prophecy's fulfillment, but perhaps a good indication we're getting closer! King of like a 'shadow' of things to come. Mind blown, socks off, looking UP! Wonderful article! I am not making light of any of this. I am watching with hopeful wonder and love this blog. As for Strong's numbers...I've started looking them up on occasion...out of curiosity. So, I'm trying to fix up my acoustic guitar a little this weekend. And part of that is I wanted to go ahead and replace the battery in the acoustic pickup that sits in the soundhole of the guitar. The battery is coin shaped size 2032. Hey Keith! Yes, I read that one last night. Love Greg's stuff. I totally believe the Rev 12 sign and the dragon sign are divine signs. My interpretation diverges, but it's not a salvation issue anyway. As far as the dead sea coming to life...I don't see a few fish swimming in a pocket of fresh water in the edges of the dead sea is a fulfillment. Ezekiel 47 is where this prophesy comes. A river will start flowing eastward from under the altar in Jerusalem. It will heal the waters of the dead sea but states there will still be pickets of salt water. Zechariah 14:8 mentions these healing waters flowing both east to the dead sea, and west to the Mediterranean sea. I feel when Christ comes back and splits the Mount of Olives to the north and south, the valley that the remnant escape through probably will be the valley that directs these living waters to the dead sea. The problem with claiming a few fish alive in a small pool of fresh water in the dead sea fulfills this Ezekiel 47 prophesy does a disservice to the word, and gives non believers more ammo to refute our faith. Thank you Stan. I do agree with you that it's important to take the biblical prophecies to their full, literal, and complete extent. I'm with you on this Gary & Stan! Biblical prophecies must be taken to their full, literal and complete end. Thank you for putting that to words Stan. Not to say we shouldn't share links, we should. We should also be able to examine their content in light of scripture to see how it all lines up. Doesn't hurt to share a find. Creating expectations based upon incomplete or incorrect information? Lord, keep us honest and our hearts pointed at You. Pastor Rick....Well put! I am probably rolling eyes when I post, but God knows my sincere heart and my beliefs in these signs in the heavens. Perhaps these fish are indeed a precursor to the fulfillment of Ezekiel 47 when those heavenly waters spring up out of the ground from Jerusalem and do indeed bring life to the dead sea! Pastor Rick....I really feel and appreciate your Christ like attitude and you continue to give examples how to conduct yourself towards others, with the same or divergent views. You treat both with equal love. I learn from your excellent example. October 10 and 11th , is the real Feast of Trumpets, check out Scottie Clarks Video. I forgot about that! His findings can be reproduced. Which reminds me that I have a time line that begins 10/10. Thanks for the reminder Gary! Interesting, if you look at the skies on the evening of 10/10 from Jerusalem at sunset; Mercury, Moon, Jupiter and Venus form something of the shape of the Tav. In ancient Hebrew that looked like an "X" or cross. 10/9 is the New Moon so 10/10 is candidate for first sighting of the crescent. If so, then 10/10 would be head of the month (Rosh Chodesh). If not, then 10/11 will be first of the month and Yom Teruah (Feast of Trumpets) if by scripture and not the civil calendar. Most interesting is that Virgo is clothed in the Sun with the Moon at her feet. It's (Revelation 12:1 ESV) all over again. Also interesting is this is the day that Venus MEETS Jupiter as Jupiter LEAVES Libra (the altar) before Venus *turns* once more in retrograde and returns to the binary star Spica in Virgo. This will be the LAST visit of Venus to Virgo as it will turn and depart until it returns late next year. I'm still digging on this from a Hebrew perspective and get slightly different results than Scottie Clarke, but do agree that the civil calendar (this year) placed FoT before the equinox and not after. (Nothing against Scottie but I'm trying to dig on my own findings; not just build on his). I will post any data I collect as a 10/10-10/11 Feast of Trumpets may provide an interesting time line. If anyone is interested in that time line I will post it too for your personal study. Again, not setting dates, but watching and learning as I spend time with G-d. Thanks for another great article Gary! Listen up. Huge earthquake Tues 9 Oct near Canary Islands. Volcano awakened La Palma. Huge landslide Thursday. Tsunami NYC. Korea nuclear war also Thursday. Darkness falls. Trumpets. After earthquake YOU need to spread this information - USAF evacuate La Palma - evacuate NYC. If earthquake happens I will come forward on YouTube and www.revelation42.com. Sorry for this. I was obviously wrong (as nothing happened on Oct 9) but I felt I had good reasons for leaving this comment. This is complex to explain. Again, sorry if I caused alarm. Don't push this nonsens when you can't back it up. There is no news as you suggest for La Palma or Korea. Please see my apology above. Wonderful article and so informative Gary, thank you! I just wanted to share a little dream I had where I saw a hand writing on a piece of lined paper. I don't know if it was my hand or someone else's hand but it kept writing the number "424" over and over on the paper. I first thought, well maybe it's a date but several April 24th's have come and gone so I finally discounted the date idea. Then it hit me to check Strong's Concordance for the number 424 - Wow was I taken back! Usage: I come up, go up, ascend. Blessed be to all! Maranatha! I had a dream this week that stuck with me as well. I was in a community of homes, not houses, but like townhouses all finished in white. They were connected one to the next and shined in the daylight. There was no night in this dream, only daytime. There were different communities but all tied together as one. It was a beautiful place and I knew people there. We visited one another and marvelled at the view from the house we visited. I can clearly remember parts of it and the feeling I had from it. sounds like 4/24/19 possibly at or during song of solomon season* Spring is for Lovers! Amen, I'm ready I hope and pray that you are to because ready or Jesus is coming. I just saw a trailer for an end times TV show Amazon Prime will be producing in 2019. The show is a six-part television adaptation of the novel "Good Omens" by Neil Gaiman. I continue to be amazed at how unaware the world is to the closeness of Daniel's 70th week, yet they're producing content right in line with the times. This is awesome Ryan! btw in connect w/ your comment as well as Rebekah's comment i wanted to point out that Amir is prophesying over n over again as he repeatedly says, "ISRAEL is existing in peace n safety like never before"! So here we are on the brink of the Draconid meteor shower and what do we have in the Caribbean? his angels fighting against the dragon. Well, I guess it makes sense eh? What better to fight fire with than lots of wind and water? For those who were interested, here is an attempt at a timeline. It is still a *rough draft* and ONLY meant as a study of the Biblical timelines we are given and how they *may* fit together. ** NOTE: The model midpoint lands just after Pesach (Passover) but is in the season of it and solidly in the Feast of Unleavened Bread. Please keep in mind this is a rough draft and still requires work. Also, please keep in mind that I do NOT build end-times timelines for a *living*. I do make models to show relationships inside of scripture but have not attempted something of this scale before. Again, I'm not trying to say we're going Home on Tuesday night or sometime this Wednesday. This is a learning exercise meant to aid in digging into scripture on a new level. Consider it an attempt to fit pieces of a puzzle together. G-D is Sovereign and I am not He. He can, and will, do whatever He pleases to the glory of His Name. I DO EXPECT that He will fulfill His word completely with perfection. Do not expect perfection from me because I'm the farthest from! Yes, it would be over the top good. It is an interesting set of dates. Still, I wonder if all of the signs are fulfilled relative to the model? Watching, waiting and off to work! It's 10 october now and no Draconids showed up! So what now! In regard to all expectations it's another fail to some predictions made. Conform scientists the outcome they predicted was of no meteor storm at all! I am a believer in Christ, still expecting Him, no mockery of the prophets etc, etc. But alas let we agree that this was probably blown up again by many 'watchers and predictors' as a major event while the profesionals already told us to expect nothing major or even nothing at all! Patrick.....You make my point. There will be many disappointed again. I totally believe in the Rev 12 sign in the sky as a divine message warning us of trouble ahead. I feel we are seeing the satanic and angelic powers at war and sometime in the not too distant future our world economy will collapse setting up the A.C. Many will turn from their faith when finding themselves in tribulation. It is all playing out to script, except I believe we have a few more "plays" to be acted out until our final curtain call at the rapture. You're not over the International Dateline from us in North America so it's not the 10th *yet*. As a matter of fact, the potential *peak* of the Draconid's won't be until tomorrow night (10/9). But let's take a mental journey to Tuesday and Wednesday night. Let's say the meteor shower is a non-event. We see nothing. Patrick is right in his conviction that it, should not, does not change his convictions. It simply means that this is not the time. But why do we keep looking? We *expect* because we know by faith that G-d will do as He has promised. Even if nothing comes to pass except the evening of Tuesday, October 10th, that should be met with a "Thank you, LORD!" in our evening prayers at the end of the day and prayers of thanks on Wednesday morning. Evening and morning, day by day, these words should be in our hearts and on our lips. Remember, all I shared was a model for study, not a prediction. I think everyone waits patiently for Jesus and is disappointed with each passing day he hasn't returned. It is impossible for believers not to notice the flood of evil that has engulfed the planet at a seemingly exponential rate. Meteor shower or not, we know the time is close and there is no harm in looking for signs that the Lord may be giving us to get our attention. I am so grateful to have this site to visit because there is absolutely no way I could ever find out some of the things I have without it. I do not live in a place where anyone talks about anything like this and I depend on the suggestions/research/writings of the authors on this site. Never once have I seen any suggestion of scriptural fulfillment stated dogmatically on here, but rather, the information is presented in a "do with it what you will and search the scriptures kind-of way" If you do not agree, this is all secondary doctrine and not a matter of salvation so what is the harm in having a discussion about it? For me personally, with each new event to look for, I come closer to the Lord instead of going the other way. I am excited that possibly the He will give us another big sign to see and then we can use it to witness to others about the nearness of His return. I hope that we can just encourage each other, and if this event does not pan out, get our Bibles back out and continue to search and discuss! I find it interesting that we have Hurricane Michael forming just at the possible fulfillment of the dragon sign. October 8th, saw two before getting in my car around 5:45AM CMT this morning before heading to work. I guess we'll see if it pans out to be a show or not. For those putting hope in the signs, don't ;they are signs put our hope in Christ. He is coming but no man knows when. Just keep looking up and don't loose faith. Prayers please brothers and sisters. Cat 3 hurricane coming straight to the panhandle where I and many others live. I have been praying for you! I hope all is well! I will continue to pray for all those affected by this hurricane. However long we must wait, we do so patiently and hopefully. What I enjoy is the mindset a lot of us seem to be developing in that we are beginning to actively look for communication from God. Signs, word, hints, whatever, it's nice to realize that God is active and we're not alone AT ALL. And I'm trying to pay attention more to seemingly random things. Like, just now a coworker was showing me a word game on their phone and they accidentally came up with a word from the scramble of letters. The word was "upward". Doesn't have to mean anything, but I'm at the point I like to consider that the random things may not always be random. Our Father created us to hope in Him, feeling empty here on this Earth. We are SUPPOSED to have this hope, this anxiety to go home and be with Him. I have great hope in Jesus and yes, I jump at each opportunity to see that we are getting closer to the rapture but if the Revelation 12:3-4 sign does not occur tonight, it will in no way compromise my faith!!! It is such an encouragement to see the testimony of my brothers and sisters. Yes, we get feeling down. That's natural. That's human. That's okay. Yes, we are called to encourage one another and yes, in word and in prayer. It's awesome to see it in action! Living like that is contagious and something we need to show to those who quietly lurk in this space and to those who are new or young in their faith. It is the high ground that we must claim and keep and defend against division. Are we not all made in the image of the living G-d? Indeed we are and He has called us to live in peace and unity with one another. We are to be known by the way we love one another. For all these things, we may agree or disagree, but I do know this that we have a hope and a promise; His name is Saviour Messiah. Accept no substitutes! That is what matters. He has the last word and I'm good with that. thanks, ozark- lol- I FEEL kinda like linus about now! Keep poking my head up through the skylight and looking around or laying on my back lookin up and waitin'... keep waiting to see one. -as we say up where I'm from in LEXINGTON, MO. "it ain't over till Draco SINGS!" ;) God bless, ozark. I'll keep you POSTED! This is national fire awareness week in the USA. The viewing area is primarily just the east coast of the US and Canada and I'm seeing tons of reports of people seeing HUNDREDS. So you wouldn't necessarily see anything in Europe. Anyway, there's been lots of cloud cover in the viewing area, but I've still gathered a dozen or so reports. One girl in Massachusetts saw around 240 per hour. Gary, where are you seeing these reports? Anything you can share? Yes, there are tons! Observatory in Slovenia reports hundreds. Radio measure shows hundred. Averaging 130 per hour. I might have to do a post tomorrow. I've saved tons of links. Factor in the Aurigids, Orionids, and Sextantids as well (all along the Dragon's tail) and it might have been about 1/3rd the number of visible stars in the sky over the course of the day. Under absolutely perfect conditions an observer can see at most 4,548 stars. I live in Bend, OR, and there was a brief small patch of sky that opened up, and I was able to see one faint meteor! same as you Pastor Rich. Have missed every major blood moon the last few years, and when we finally got a break in the sky last night for me to see the Draconids, there were none...only for me to discover today that we don't see them in the Southern Hemisphere. Gutted! I was blessed to see all four of the blood moons. One in particular when my wife was intensive care in the hospital and had actually went "code 99"...a call for all medical to rush to her aid . They saved her life as she had a blank stare looking at the ceiling without a blink of her eyes. No response and I alerted the nurses. I knew the blood moons were signs in the sky from God,for trouble ahead. Likewise the Rev 12 sign uniquely tied to 9/23/2017 as I relentlessly verified for myself on Stellarium in a thorough Pastor Rick like manner. Also, I can see these draconoids as possibly being a nice fulfillment the "other wonder in heaven" Rev 12 mentions. I also can see that hurricane "Michael" also is a piece to the puzzle. I feel it is more than coincedence that that name is used at this time of converging signs. If it is indeed divine , I feel that Michael is the restrainer to be taken out of the way, releasing Satan to unleash his influence and allowing the A.C. to come to power. Just me thinking out loud here in that when hurricane Michael is taken out of the way..in other words diminishes...this "perhaps" could symbolize to be a sign of Michael the archangel removing his restraining forces that have been holding back Satan. I'm sorry about the crisis with your wife Stan. I know it is a hard thing to endure. I believe that G-d wastes nothing. Not even our sorrow and pain. All of it He brings to good. "The sixth edition of the World Government Summit is hosting the inaugural Global AI Governance Forum, in recognition of the rapidly evolving Artificial Intelligence (A.I) technology, and its implications on humanity. While institutions and government entities are seeking to address the challenges and opportunities that A.I brings, there is a general lack of cohesion and understanding of that domain. In order to advance its safe evolution and impact, the UAE is aiming to create an aligned Global Strategy for the Governance for A.I. The aim of the Roundtable is to facilitate dynamic policy recommendations and create a roadmap for all nations to adopt. This year we are gathering over 50 of the world’s foremost thinkers, leaders and practitioners of A.I in one room – to contemplate and develop ways to help guide us shape the future of society." 242-days, 8-months, since this round table *fellowship gathering* at the 6th World Government Summit to discuss the future of humanity through AI and here we sit with what going on all around us? Just for fun, what says Strong's? Usage: I leap, leap up; of water: I spring up, bubble up. Am I getting enough sleep? Maybe it's a leap my imagination? Rising? Leaping? Really?!! Some of us, myself included, feel that the beast from the earth may be AI. Quantum computing relies on states of atoms which may be understood as a type of binary (base two) numbering system. Computers are built upon the dust of the earth, petroleum products, metals and silicon thus rising from the earth. (Keep in mind not only am I a Pastor but I am a IT Systems Engineer with virtually 4-decades experience in computing). Today (10/9) is the new moon or Rosh Chodesh and head of the *astrological* seventh month of Tishri. (Tipping hat to Scottie Clarke) I say *astrological* as the stars, sun and moon indicate it's the eve of the 49-hour celebration of Yom Teruah (Feast of Trumpets). Knowing that the Hebrew calendar divides summer from fall by the Autumnal Equinox (meaning "equal night") and that the month of Tishri begins the fall; I think it safe to say that the civil calendar is off this year (2018) by about a month. Learn more about these seasonal cycles at US National Weather Service. The constellation symbolic of this month in Judism is Libra. Tomorrow (10/10-10/11) is the day that Venus, the bright morning star, meets Jupiter, the king planet, in the sky at Libra as Jupiter departs Libra exiting retrograde motion and continues across the ecliptic. If it were not for the weight of all of the signs, I would think my imagination were running away with me! Remember that I had mentioned (above) that Jupiter will appear to be *caught up* by the Sun as our star enters the constellation Scorpius next month; and that this would occur on Tuesday, November 27th? Counting from today (10/9), Rosh Chodesh, to (11/27) is 50-days. (10/10) to (11/27) is 49-days (seven sevens) as in the number of years of the Jubilee. Hmmm, freedom? Birth? A new church? I have been finding some interesting articles on the symbolism of the new moon. "All that transpires on this day [Yom Teruah / Feast of Trumpets] is characterized by concealment. All other festivals fall either when the moon is full or near full. Yom Teruah, however, falls on the first day of the month, when the new moon is just barely revealed. The House of Israel is symbolically compared to the moon and is radiant on its Shabbats and Festivals. On Yom Teruah, however, Israel diminishes herself and conceals its greatness in awe of the Day of Judgment. HaShem, [the Name / G-D] too, places a cover of concealment over His people’s sins and accords them forgiveness." Have you not heard that the Feast of Trumpets occurs on the day and hour of which no one knows? This is because is depends upon the witness of two who see the new crescent moon which marks the first day of the seventh month and may be obscured by clouds and weather. Only G-D knows that day or hour as it is He who placed the sun, moon and clouds in the heavens according to His will and the glory of His Name. Did Jesus hint at this as recorded in (Matthew 24:36 ESV)? Clearly is not Jesus talking about the Rapture? Reading of this passage certainly suggest Christ is point toward the resurrection and rapture of His Church and likens the day to one in which we will not know the day or the hour. That day and hour are a dark mystery linked to the Feast of Trumpets. An appointed day which is now breaking in Israel as I type this message as it is twilight there and nearly dark. Wednesday (10/10) is risen in Israel. Rich, Stan, et al, I'm working on a big post... hoping to get it out today. Awesome and looking forward to it! Looking forward to it! We have been all overcast as well!